The day I decided to try my hand at what I call a “real” quilt (meaning something other than patchwork) was an important day in my life. I’ve made many things since, and have many projects in various stages of progression. I think that on most occasions I would even call myself a quilter. Until I saw this quilt the other day, and wondered if perhaps I still deserve the same kind of ranking that I gave myself years ago. I found this at American Jane, and I love it! It’s called Mothers and Daughters. I love the colors, the pattern, everything. But I’m pretty sure it’s way out of my league. I find myself wishing that I was a REAL quilter. And then I think that someday, just someday, I might be. how do they do that, I mean seriously? and sorry for being so uneducated, but what is real quilting? I’m confused but super interested! Just wanted to say that I came upon your blog by accident. It is the best accident I’ve ever had. 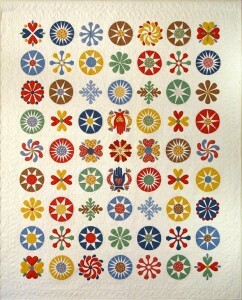 I can’t believe that you have made soo many beautiful quilts, and still had time to blog about them. Mind you, this is from a 72 year old wannabe. I have lots of patterns, materials, tools, etc. and am still afraid to make the 1st cut. The only quilt I have made was a denim quilt with jeans from a thrift store, and now I’m finding lots of seams coming undone. It is tied and finished so not too easy to take apart. So now I’m an old chicken. Anyway, I’ve looked at all of your back pages and do feel inspired and I wanted to say “Thanks” for your wonderful Blog.